What’s clear: Navy football will join the Big East come 2015. From the size of the conference (13 teams in 2015, as planned, or an even number to avoid a scheduling nightmare?) to the fate of future TV deals to the structure of college football’s postseason, nothing is certain. But there’s at least a hint at one of the big mysteries — how the league will set up its two divisions. The Philadelphia Inquirer reports today that in 2013, with 12 teams likely participating, the conference will divide into East and West divisions, with geography the deciding factor … almost. Temple, which rejoins this season after being gone since 2004, will be shipped westward, rounding out a division with Boise State, Houston, Memphis, San Diego State and Southern Methodist, according to the report. That would leave Central Florida, Cincinnati, Connecticut, Louisville, Rutgers and South Florida in the Big East (East). Where does that leave Navy? Would the league blow up the divisions after two years to allow the Mids to play an East Coast-based schedule, including nearby Temple and Rutgers? Would Navy take Temple’s spot and head west, taking advantage of the Mids’ national profile and drawing power in places like San Diego? 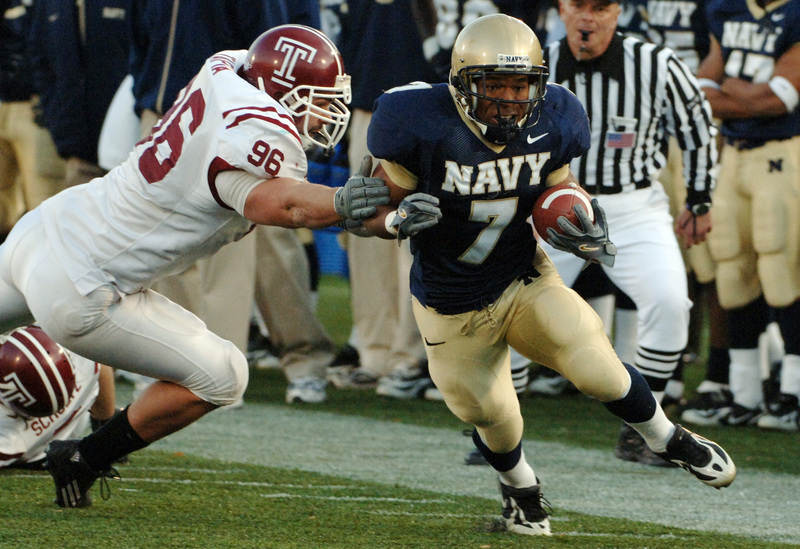 Would Villanova finally get a long-rumored invite and create an I-95 regional rivalry with Navy and Temple? Or, with its TV future uncertain, would the Mountain West Conference be prime hunting ground for further Big East expansion? Would an in-house service academy rivalry between Navy and Air Force be a natural fit? The Falcons may have been left out of the initial western movement, but that hasn’t stopped reports like this. Tired of waiting for this superconference stuff to sort itself out? Want some actual Navy football to hold you over? Click here for details on Saturday’s annual spring game.